My son and I had our very first one day outdoor sport climbing adventure with a guide on June 2016 in Chiang Mai, Thailand. It was phenomenal. I was hooked further into climbing and this time it was outdoor. The outdoor experience was totally exhilarating in comparison to the indoor. The feel of the rocks were definitely different from the fake rocks of course. You can absolutely take advantage of any rock holds outdoor and not constrained to only a color scheme rock holds of an indoor gym. However, the outdoor climbing is much more intimidating for sure by the shear height and the vast open space of the mountain. The guide tested us on an easy outdoor route to see what we can climb. He also taught us a process called “cleaning sport anchors” where you would clean the anchors and remove the anchor equipment at the end of a climb for every route. This procedure was complicated and I was so glad to have an opportunity to learn it. I definitely need to repeat learning this process many more times to stick it in my head. It is something not to take lightly because many accidents occur when we skip steps or fail to have a back up system in an anchor-cleaning sequence. Before we could climb, the weather did not hold out. A huge downfall descended upon us and we were totally soaked. I thought we were done for the day. However, there was a cave nearby which was totally shaded from the rain. I totally recommend hiring a local guide for your first handful of times outdoor climbing. There were a lot of safety procedures that I needed to be aware of as well as applying them to my climbing routines. Not only the local guide helped me with the setup of our climbs, they led us to the sweet and fun spots that I would not figure out on my own as a novice climber which saved us a lot of time. totally challenged and exhausted by the fifth route. 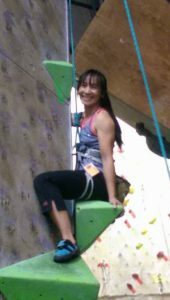 I learned a lot and totally recommend for all to seek out CMRC (Chiang Mai Rock Climbing Adventures) if you ever travel to Chiang Mai, Thailand. The staff at CMRC was very nice and friendly. The guide was a great climber and he was very knowledgeable of the area. Several things I learned about outdoor climbing: always have two to three different back up system just in case your first one fails and always climb with a partner. Two pairs of eyes are better than one. All in all we had amazing and safe climbs in Chiang Mai, Thailand. Chiang Mai, Thailand was my very first trip outdoor climbing adventure with my son. To read more of our door climbing adventures, please visit my Outdoor Climbing Reviews. You can also find our outdoor climbing reviews on the main menu tab under Reviews -> Outdoor Climbing.